Washington, DC–(ENEWSPF)–May 27, 2016. Oxitec, a self-described pioneer in using advanced genetics to control target insects, has petitioned the U.S. Food and Drug Administration (FDA) to grant emergency approval of genetically engineered (GE) mosquitoes to fight the spread of the Zika virus. Oxitec has proposed a trial to determine the efficacy of their self-limiting mosquitoes for the control of Aedes aegypti, a type of mosquito known to transmit the Zika virus, in Key Haven, Monroe County, Florida. However, some in the environmental community are concerned about the possible non-target effects of releasing these genetically modified mosquitoes into nature and urge additional research in the lab. The plan for a release of these GE mosquitoes has been in the works for a while. In February 2015, it was reported that the Florida Keys Mosquito Control District (FKMCD) was working alongside Oxitec to release these GE mosquitoes, but, at the time, the plan had not yet been finalized. A change.org petition against the release garnered over 146,000 signatures and continues to grow, with numbers around 168,000 to this date. In February 2016, Oxitec submitted a draft environmental assessment to FDA, and a month later, FDA published a preliminary finding of no significant impact in support of the Key Haven field trial. The public comment period for these two documents closed on May 13, with over 1,000 comments, and FDA is currently reviewing those comments and all other information that was submitted. Oxitec is not currently allowed to conduct field trials until the FDA has finished its review. Oxitec has produced the GE line of Aedes aegypti with the intent of suppressing the population of that mosquito at the release site. Aedes aegypti is known to transmit potentially debilitating human viral diseases, including Zika, dengue, yellow fever, and chikungunya. 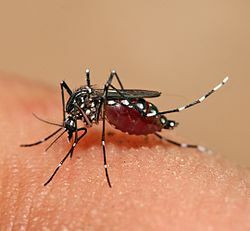 With the exception of chikungunya in Florida and a 2005 outbreak of dengue in Texas, there have not been any local transmission of Zika and yellow fever in mainland U.S. Local transmission requires the existence of diseased mosquitoes, as opposed to insect-borne diseases that are contracted while traveling abroad. Open field trials of the GE mosquito have been conducted in certain places, such as Brazil. Experiments with Oxitec’s GE mosquitoes call for large numbers of modified males to be released in the wild to mate with female mosquitoes and produce offspring that are unable to develop. To create these autocidal male mosquitoes, the company uses the antibiotic tetracycline to act as a chemical switch, allowing the GE larvae to develop and survive in the lab, rather than die immediately as planned in the wild. Larvae are supposed to die in the wild due to an absence of tetracycline. However, internal Oxitec documents discuss an experiment where 15% of insects in the lab survived because mosquitoes were fed off of chicken-based cat food that contained low levels of tetracycline even after it was heat-treated in attempts to remove traces of the antibiotic. Tetracycline is used in a variety of different settings, from agriculture to the control of human diseases, and ultimately makes its way into the environment. Studies show that most wastewater treatment plants are unable to effectively remove tetracycline antibiotics, and the compound is frequently detected in surface water, ground water, drinking water, wastewater, soils and sediment. Thus, low levels of tetracycline in the environment may result in only a temporary reduction in the numbers of disease carrying mosquitoes. And there are further questions regarding the impacts of how tetracycline-exposed survivor GE mosquitoes may impact human health or wildlife. Speaking to USA Today, Peter Hotez, dean of the National School of Tropical Medicine at Baylor College of Medicine in Houston, said questions remain about the altered bugs. Oxitec has not yet shown that the mosquitoes reduce rates of diseases such as Zika. And, tests of insects were relatively small, meaning there’s no way to know whether the technology will be effective on a large scale, he added. Control of disease-carrying mosquitoes can be successful when emphasis is placed on public education and preventative strategies. Individuals can take action by eliminating standing water, introducing mosquito-eating fish, encouraging predators such as bats, birds, dragonflies and frogs, and using least-toxic larvacides like bacillus thuringiensis israelensis (Bti). Community based programs should encourage residents to employ these effective techniques, focus on eliminating breeding sites on public lands, and promote monitoring and action levels in order to determine what, where, and when control measures might be needed. New Jersey’s Cape May County provides an excellent example of a low-risk alternative to employing insecticides or introducing GE species. Cape May has used mosquitoes’ natural predators, tiny copepods, to eat the larvae of the mosquito. Through education of proper cultural controls, and least-toxic and cost effective biological alternatives, the use of risky technologies such as toxic pesticides and GE mosquitoes can be avoided.